Planting hydrangeas in the right location is extremely important. Location can make the difference between growing a lush, lavishly blooming shrub and one that struggles and produces scrawny blooms. For information on choosing the right hydrangea for your climate (planting zone), see Choosing the Right Hydrangea. All hydrangeas will bloom and grow well in morning sun and afternoon shade. This is especially true of the commonly grown Hydrangea macrophylla. Macrophylla hydrangeas are the blue and pink mopheads and lacecaps. The further north one lives the more sun hydrangeas need and can withstand. While mophead hydrangeas can grow well in all-day sun in Chicago, they would struggle to survive in afternoon sun in Atlanta. Some visitors to this site who live in cooler climates such as the northeast or northwest report that their hydrangeas do beautifully in full sun all day. No hydrangea will do well in HEAVY shade, such as under a shade tree. The blooms will be sparse and will not develop fully. If your landscape is mostly sunny (and hot), you may wish to grow the PeeGee (paniculata) hydrangea, which thrives in all day sun as long as it receives adequate moisture. PeeGee hydrangeas actually need at least 5 hours of sun per day to bloom well. The Oakleaf hydrangeas will also grow in sun or shade, but the blooms last longer if they get a little afternoon shade in hot climates. The leaves on the Oakleaf hydrangeas will "color up" best in the fall if they receive some sun. VERY IMPORTANT: Choose a location where your hydrangea can reach its full size without pruning. 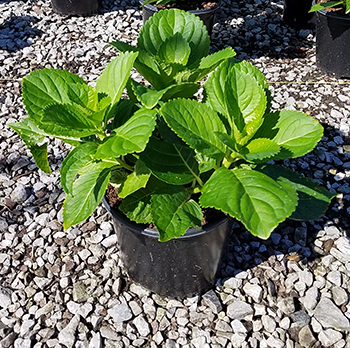 For normal sized hydrangeas, expect the plant to reach at least 4 ft. X 4 ft. Hydrangeas are almost impossible to keep pruned to a smaller size than they ultimately wish to grow. Plant in well-drained soil! If soil is heavy, add roughage such as pine bark mulch (Make sure it's ground BARK not ground WOOD). Do not over water, esp. in clay soil. 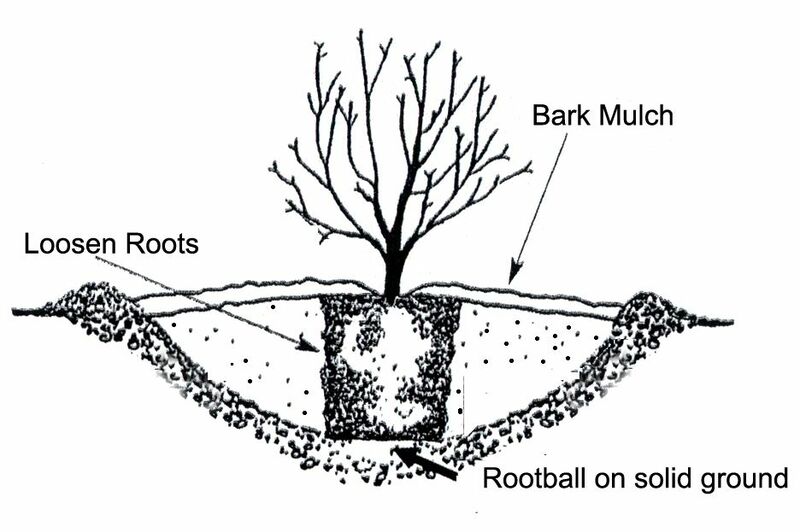 This can lead to root rot. Do not plant too deeply. Plant at the same depth the hydrangea was planted in the pot. Plant in early summer or fall. Transplant a hydrangea when it has become dormant and has lost all of its leaves (late fall or winter). Place the hydrangea in an area where it can get plenty of moisture. Supplemental moisture is especially important the first year or two and during droughts. Hydrangeas planted under a tree often fail to thrive. This is because trees roots are very aggressive and are drawn to the rich, moist soil usually provided for hydrangeas. No matter how many of the tree roots you remove to make room for the hydrangeas (and be careful not to remove too many), the roots will all be back within a year (unless you remove too many and kill the tree!). Also, as mentioned above, under large hardwood trees the light is often insufficient for growing hydrangeas. If grass won't grow in the area, hydrangeas probably won't either. The Oakleaf hydrangea is more temperamental about "wet feet" than the other types. Make sure that the Oakleaf will get perfect drainage in the area in which it is planted or the roots may rot. This is especially true when it is first planted. After the Oakleaf becomes established, it is very easy to grow. After planting a hydrangea, DO NOT LEAVE IT ALONE. Too often we rush to get our shrubs planted before we leave on vacation. Be on hand to give it some TLC and to keep it well watered. Most people know that "transplanting" means digging a plant up from one location and planting it in another. Authorities agree that the BEST TIME to transplant hydrangeas is when they are dormant, i.e. after most of the leaves have fallen off the hydrangeas. When I lived in SC we transplanted hydrangeas in late November to late December, but if your ground isn't frozen, January and February are fine, too. When digging a hydrangea to transplant, dig up as much of the rootball as possible. Since the roots are fibrous and form a ball filled with soil, the plant may be VERY heavy, so you might want to get some help with this. Replant the hydrangea in an area that is shaded during the afternoon. This will not only help the plant to survive, but it is the preferred location for hydrangeas, especially in the South. If you transplant while your hydrangeas are dormant (the best time), water them deeply one time. They may need no more water until spring when warmer weather arrives. Hydrangeas must be kept watered very well the first and second summer after they are transplanted. The best way to water is deeply. Use a hose to water rather than a sprinkler system. However do not over-water. Watering every day can be just as destructive as allowing the plants to dry out. If the leaves wilt and the soil is moist enough, mist the leaves each day until they recover. If your soil does not drain well, do not allow it to remain soggy around the hydrangeas. This is especially true for oakleaf hydrangeas which will rot in a heart-beat if they stand in soil that is wet when first planted.